Death is a fact of life that touches every family. Learn how to help yourself and others take the journey from grief to personal renewal. Although death is an inevitable fact of life, most of society is ill-equipped to handle the ramifications of loss and the ensuing grief. The avoidance of discussions about what to expect after losing a loved one, coping mechanisms, and how to move through grief in a healthy manner is the root cause of the bereaved floundering as they scramble to pick up the shattered pieces of their lives. As a first step, it is both healing and instructive to read and hear about how others cope with and manage their grief. 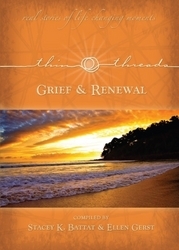 Kiwi Publishing announced today the publication of their newest special edition, "Thin Threads of Grief and Renewal." This small volume illustrates the beauty and strength of the human spirit through eleven uplifting tales of untold grief and how each author found personal renewal. By reading true stories of the triumph over loss, the bereaved can be infused with the belief that he or she is not alone with his/her dizzying array of confusing emotions that are categorized as grief. It is through this process the mourner can find the sustenance and understanding so desperately needed to mend. Oftentimes people find it uncomfortable to be around the bereaved. They want to offer assistance, but don’t know what to say or what to do. Due to these feelings of powerlessness to help, they might avoid the bereaved after the funeral or an initial contact. Of course, it is a natural progression for people to return to their own busy lives. However, this leaves the mourner feeling more alone and deserted by both his/her loved one as well as supposed close friends and/or family. To the bereaved, it seems as if the world has forgotten about his/her loved one because most hesitate to even bring up the deceased’s name for fear of upsetting the griever. In actuality, it is more painful to act as if the deceased never existed. If you want to support your friend or family member in his/her grief – perhaps weeks or even months after a death – commemorate the memory of that person in some meaningful way. Sending a mourner a copy of "Thin Threads of Grief and Renewal" is one wonderful way to let the bereaved know that he or she is still in your thoughts and that you, too, miss his/her lost loved one. Ellen Gerst, co-editor of "Thin Threads of Grief and Renewal", speaks with expertise on this subject matter. She is a former widow who transformed her life after the death of her first husband 15 years ago. She puts the knowledge she gleaned from her grief journey to good use every day in her work as a grief coach. As a featured blogger on LegacyConnect, she also offers coping with grief and loss tips from a “been there/done that” perspective. To learn more about this concept, which Ellen used in coping with her own grief, read the Introduction to "Thin Threads of Grief and Renewal" on Scribd. Thin Threads® Stories is a series of books that chronicle real life changing moments that cover a variety of topics, including love and romance; teachers and mentors, joy and inspiration; recovery and survival; and compassion and giving. To order, connect with Thin Threads through their website. It is here you can also submit your own “Thin Thread” story for possible publication in future volumes. For tips on coping with grief on your way to renewal, connect with Ellen on Facebook at Thin Threads of Grief and Renewal. Look for your own “thin thread” moments each day – those circumstances or people you encounter – that can change the course of your life for the better!